I am so sorry for the extended posting hiatus here and at my other two blogs, Filmi Geek and Sounds Like Power. The past half-year or so has been trying for me, with lots of soul-searching and thinking and introspection. I had to let something go, to have the energy for all that, and it was the blogs that suffered. For you, GOAT readers, that meant I wasn't here to muse on the most interesting parts of that time, like many excellent world music concerts or the course in syntactic theory that I took. The good news is that I have decided to say goodbye to my career as a patent attorney, and in a little over a month I will be starting a new career and a new job as a technical writer. I don't know exactly what the future holds, but I miss blogging and I will definitely be back. So please stay tuned for posting soon on all three of my blogs as I turn the page on my professional life and, with any luck, get back some of the energy I used to spend here thinking and writing and communicating with all you folks out there. Thanks for reading, and I'm looking forward to getting back in touch with all of you. Apologies for the hiatus; Second Life ate my blogs. I am, um, reprioritizing at the moment, and so I will try to post more regularly to at least one or two of the blogs, even if I can't quite manage all three. 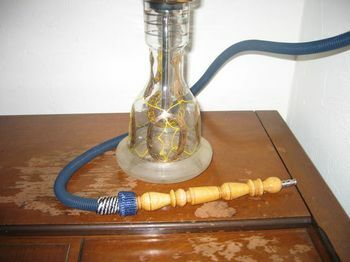 It should have a ceramic bowl at the top into which the flavored tobacco is placed; the hookah came without one but I ordered one with the tobacco so I'll be all set. A closer look at the vase and the business end of the hose. 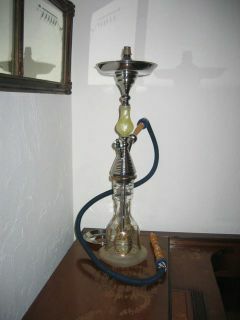 And here is another look at the top end of the houkah. 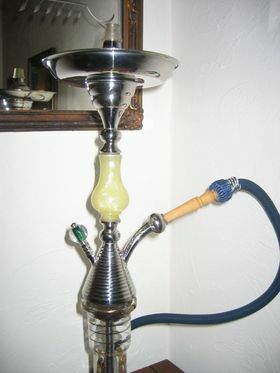 I'll post again when I get the bowl and coals. Our good friend K passed away this weekend. She had been fighting against cancer for more than five years now. But while her death is no surprise, it's still a tragedy, and it still hurts. All weekend we've been remembering the things about her that made us smile. Some of them have sneaked up when we least expected - in the middle of a conversation about something unrelated, someone says something that triggers a memory of K. We found pictures of her taken at our wedding. We've been weepy. K's funeral is Tuesday, and we are collecting our tears and funny stories to share with K's family and other friends who loved her. We will always miss her. Nearly two months ago, right as I was becoming distracted away from frequent blogging, I mentioned the World Music concert series from which we'd chosen a selection of shows to attend. Last Friday was our first show of the Spring 2008 series - Ladysmith Black Mambazo, at Sanders Theater at Harvard. The South African choral group Ladysmith Black Mambazo became very famous in the US after they performed on Paul Simon's blockbuster album Graceland, but even by then they had already been doing their thing for many, many years - the group was founded in 1960 by Joseph Shabalala, who still leads the group today. In their early days they performed in singing competitions in mining townships, and they were so good that they demolished the field - eventually they were asked to retire from the competitions to give someone else a chance to win. 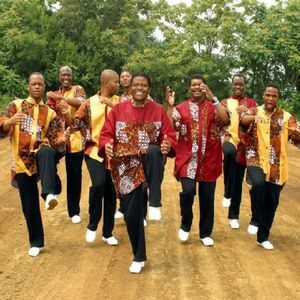 Today, most of Mambazo's original members have retired or passed on, and Shabalala's four sons are carrying on the tradition along with the other family friends and professional singers that make up the nine-man group. But Mr. Shabalala is as energetic as ever, and seemed tireless in Friday night's performance, jumping and kicking and dancing with as much verve as any of the younger men. Indeed, the dancing - the men's exuberance - was the best part of the show. The songs themselves are pretty - the singers' mastery of tight harmony and complex rhythm is awesome - but a little unvarying; every song is at the same tempo and in the same mode, and each song concludes with a lengthy and repetitive vamp segment. Some time ago I read a review of a Youssou N'Dour album that dug at the genre of "world music" for being "as tedious as the dinner parties at which it is played." Being a hungry consumer of music from all over the world, I bristled at this characterization, but I also understood the reviewer's point. There is a certain strain of world music that feels particularly packaged for the West, for an NPR-listening, liberal-voting audience. Ladysmith Black Mambazo suffers a bit from this ailment, perhaps as a result of having been Paul Simonized so long ago (they did perform "Homeless," a tune from Graceland, at Friday's show). Still, they are an easy introduction to African music for people new to the sounds. The choral stylings are unquestionably delightful, and the guys put on a charming and entertaining show. David and I are members of the unimaginatively named "World Music" organization, that arranges and promotes a series of concerts in the Boston area each season. As members we get advance deals on the best seats for all their concerts, and in seasons past we've seen many excellent shows (a few of which I've written about here): Indian performers like Zakir Hussain and Rahul Sharma, and a kathak dance demonstration by Pandit Birju Maharaj; African artists like the outstanding Oliver Mtukudzi, the legendary Hugh Masakela, and our long-time favorite Angelique Kidjo; and unusual acts like Finland's Varttina. We just got the catalog for the Winter-Spring 2008 series, and we went hog-wild - we'll be attending about two concerts a month from January to May and we're really excited about it. On the menu are some great performers we've seen before, like Angelique, Mr. Masakela, Zakir sahib, and Mali's Toumani Diabate; we're also going to hear a pair of Pakistani qawwals, which I'm really excited about, and interesting-sounding loungey fusion act called Pink Martini, and a bunch of other (mostly African) stuff. I'll try to write at least a little about each one here, as I wish I'd done for all the terrific concerts we've seen already. And you can see World Music's event list here. Here is a piece of science news that gave me a little chill, and made me feel very small. That's an overreaction, certainly, and yet there it is. A couple of weeks ago Amodini (who has both a general stuff blog and one for Hindi films) tagged me with the "middle name tag." I was rude and didn't respond right away, because I was overwhelmed with work there for a few weeks and haven't had time for too much blogging. I've had a reprieve, though - a trial that had been scheduled to begin three weeks from now has been moved to the spring - and so I wanted to thank Amodini, and pick up this tag. 1. You must list one fact that is somehow relevant to your life for each letter of your middle name. 2. If you don’t have a middle name, use the middle name you would have liked to have had. M: Middle name. I have one. In fact, unlike many people, I use mine regularly, preferring to write my name out in full - first, middle, last - in correspondence, court papers, and even informal settings. My name doesn't sound right to me without it. Both of my brothers have middle names too, but they don't use them, not even an initial. I'm not sure why that is; I've never talked to them about it. "Miriam" is an essential part of my name, and I can't imagine not using it. I: India. Why? I don't know. I'm not Indian; I don't pretend I am, and I don't aspire to be. But I watch Indian movies, study an Indian language, and from time to time have been known to cook Indian food or wear Indian clothes. There it is. I haven't been to India; mostly because David and I are poor planners and haven't yet gotten around to making it happen. I once joked that I decided to learn Hindi because that's the language the spoken by the voices in my head and I wanted to understand what they were saying. Sometimes that feels not too far from the truth - I have no idea where this came from. R: Religion. It comes and goes. There have been times in my life when I could not imagine Friday night without Shabbat services. Now is not one of those times. David and I haven't gone to Shabbat services regularly in many years. I wouldn't mind getting back into the habit, but I don't want to take responsibility for it; I want David to select a congregation and say, "we're going, tonight." I: Idols. I have one. A: Ambivalent attorney. Attorney is my real job; ambivalent is what I am about it. I don't dislike everything about it, and I'm trying to make some changes to my practice that, I hope, will help me enjoy my work more. But I'm already on my second career, and I'm fairly certain I won't be doing this for the rest of my life. No specific plans yet though! In completing this tag I am supposed to tag other bloggers, one for each letter in my middle name - six in all. But the last time I tried to tag some bloggers it didn't go all that well - only one of them responded to the tag. So I'm going to do something different this time. If you read this, and you have a blog of your own, consider yourself tagged. Just let me know, via a comment or an email, if you pick up the thread, and I'll add a link to your post here. With our kitchen finally intact again, we've been grocery shopping and cooking - nothing fancy, just mundane meal preparation of the sort that ought to be completely unremarkable. Four months of take-out dinners and microwaved Indian food from a box has given me a whole new appreciation for even the simplest home-cooked meal. A couple of trips to the wonderful gigantic Asian grocery store, Super 88, have yielded some nice treasures. 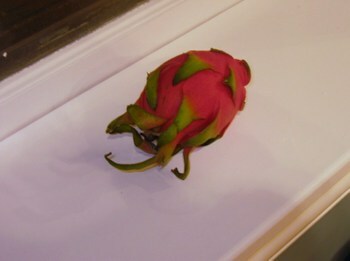 This incredible fluorescent fruit caught my eye and I had to take it home. 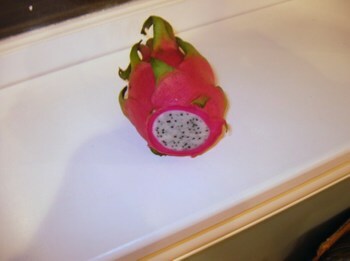 It's a dragon fruit, also called a pitaya, the fruit of a certain kind of cactus. It's native to North America but is evidently now cultivated in southeast Asia. It's dramatic, beautiful, and quite tasty too. The flesh is white and peppered with tiny black seeds, and after I cut the fruit in half it peeled easily out of the fuchsia rind. The flesh is similar in texture to kiwi, and its taste is crisp, very refreshing, and not terribly sweet.